This Accounting Interview Questions and Answers PDF contains 30 question and answers. All explanation and answers are based on user submitted comments and opinion. Exforsys Inc is not responsible for correctness of the same. This guide is designed to help anybody who is planning to attend accounting job interview in any company, big or small. 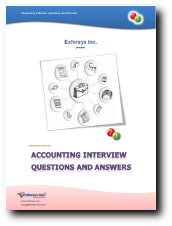 With the accounting interview question and answers provided in this PDF, you can better prepare for the interview and feel more confident during the question and answer session with your interviewer. Last edited by admin; 05-15-2012 at 09:43 AM. I am not able to download PDF file why? For those who are not able to download, please make sure you allow pop-up for this website. Generally it is the browser that is blocking the popup.